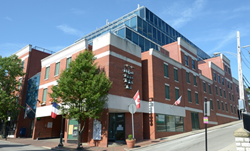 NRL Mortgage's new office space in Mount Adams. NRL Mortgage’s Mount Adams branch will host a Grand Opening event on Wednesday, July 11 to celebrate their recent office expansion and acknowledgment as a Top Workplace by the Cincinnati Enquirer. NRL Mortgage, one of the fastest-growing companies in the U.S., has increased sales by 30 percent and been recognized by several prominent publications in the past year. Caveh Azadeh manages NRL’s Midwest region, serving the Tri-state area with offices Lawrenceburg, Montgomery, and Chicago. Last month, Azadeh decided to relocate his headquarters to a larger building to accommodate continued growth. The Grand Opening event will take place from 12-5 p.m. and will feature a ribbon cutting ceremony by the Cincinnati Chamber of Commerce at 1:30 p.m.
1111 St. Gregory Street will allow the branch to hire an additional 12 to 15 employees—following a 25 percent increase in staff already this year. In addition to winning the Top Workplace award by the Cincinnati Enquirer, NRL has also been ranked as one of the largest residential mortgage lenders in Greater Cincinnati by the Cincinnati Business Courier for the past eight years. Azadeh strategically structured his regional office after the corporate operations center, providing services and support to originators and business partners that other mortgage companies cannot. In-house underwriting allows his branches to offer solutions such as Funding on the Spot, in which funding authorization is provided to a title company at the time a wire is delivered versus after the signed closing documents are reviewed.